“Actually it is not that difficult,” Mai assured. “The first year I questioned myself. I worried I would not have anything to eat at all. But the second year the crops were so beautiful.” Mai Hootachai modestly smiled with pride. Her profound determination to transition from the use of chemical fertilizers, herbicides, and pesticides to organic agriculture has yielded a success story. Mai Hootachai was born and raised in the district of Kudchum, Yasothon Province, Northeastern Thailand. Throughout her youth, Mai diligently helped cultivate her parents 10 rai (approximately 4 acres) of farmland. Her parents grew rice and chili peppers. Mai’s family adopted the use of chemical fertilizers to produce higher yields and increase profit. As a child, Mai did not receive proper education on the local culture of traditional agricultural production and the effects of chemical fertilizer on the land. Once her parents were no longer capable of farming, Mai inherited the 10 rai of land. Wanting a family of her own, she married and and before long gave birth to three children, two sons and a daughter. Her eldest son (22) is currently studying in Taiwan and her second son (18) was ordained as a novice monk at the early age of thirteen. Mai is confident her daughter (5) will remain in the village and inherit the family farm. “She is already helping during the harvesting season,” Mai declared. In the years following the Green Revolution, the common use of chemical fertilizers on farmland throughout the region began to negatively affect the health of the villagers. Although her parents didn’t suffer any serious health problems related to the use of chemicals, a number of Mai’s friends and extended family members became ill. “Since my brother-in-law used both pesticides and herbicides in his rice fields, his leg got severely infected,” she recounted. Mai’s brother-in-law contracted Glanders, commonly referred to as ‘rotten leg disease’. Glanders is an infectious disease that is caused by the bacterium Burkholderia mallei. “The doctor had to replace his infected flesh with skin from other parts of the body. He was in chronic pain,” she said sadly. 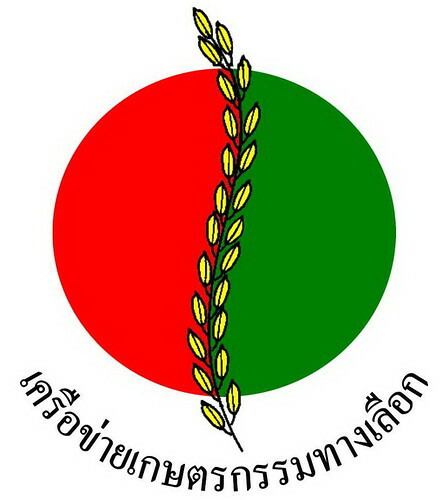 As ‘rotten leg disease’ spread extensively through the village Mai began to question the use of chemical fertilizer and considered the transition to organic agricultural production. Mai embarked on an investigation of traditional farming fertilization methods. “If you decide to switch to organic agriculture, you do not have to spend a lot of money,” she realized. “Because my parents used chemical fertilizer, they were forced to spend.” Mai found that chemical fertilizers were uneconomical and expensive in comparison to cultivating organic compost. Although Mai did not experience any financial problems during the switch, she found organic agricultural production to be far more labor intensive. “Before when I was using chemicals, I only had to work with fertilizer bags. But now, I have to do everything. I have to cultivate organic fertilizer and haul it to the farm,” she affirmed. But with help from her husband and extended family members, Mai explains that the workload is manageable. In spite of the numerous responsibilities demanded by traditional agriculture methods, Mai is now proud to sell organic products at the Green Market. Established by the AAN, the Green Market is an alternative marketplace available for small-scale farmers to sell organic vegetables and local varieties of rice. 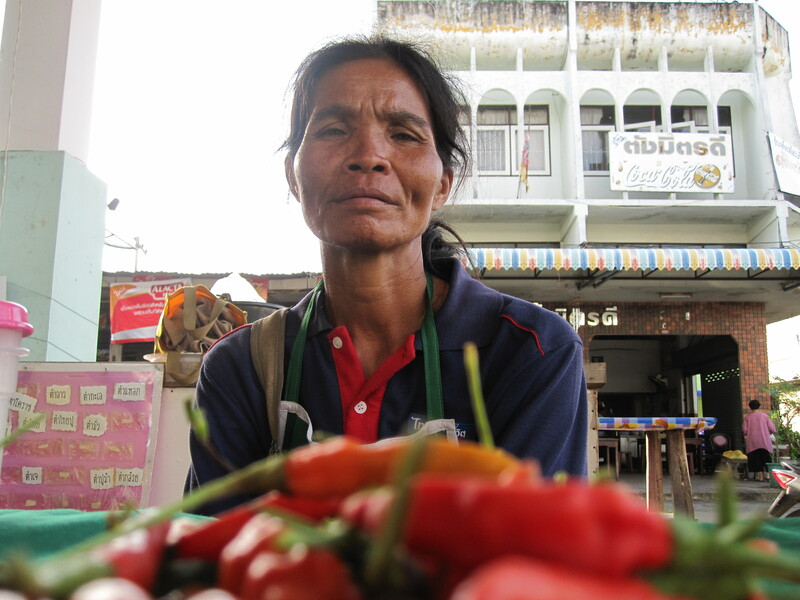 Mai successfully supports her family by selling the organic products grown in her rice fields and garden. On her 10 rai of land, she now uses organic compost (cultivated by pig manure) to grow rice, vegetables, chili peppers, corn, tomato, and pumpkin. However, since her rice fields have flourished and vegetables have prospered higher yields, many in the village have grown curious about the organic movement and approached Mai for advice. “They are starting to ask questions,” she chuckles. As a result, Mai has now taken it upon herself to educate her peers and neighboring villagers about alternative agricultural production options and local seed varieties. “I always tell them, ‘don’t use a lot of chemicals! You can easily become organic. You can grow your own vegetables and even sell the vegetables you grow.” In fact, Mai has had a number of customers call and reserve orders of rice. “Be patient! Make your own organic fertilizer, put it in the fields, and before long you will see higher yields”, she advises farmers. Remarkably, Mai Hootachai makes the transition to organic seem practically ‘natural’.